Last year a few events correlated in my life that brought the flaws of the beauty industry to the forefront of my mind. I was taking an Ethnicity and Gender in the Media course at Colorado State University that taught me about sexism and racism in media advertising. While degrading ads exist across many industries, I was really shocked by the issues that are present in the beauty industry. One of the most disturbing issues for me is the beauty standard that is fabricated by these advertisements. With the use of photo editing software, images of women (and men) are manipulated to create an idea of beauty that is unnatural and simply unachievable. Below is an image from a wonderful article that discusses this issue,“Photoshop, Altering Images and Our Minds!” from the blog, Beauty Redefined, Taking Back Beauty for Females Everywhere. The Beauty Redefined post discovered, [this is the] “same mode with differing degrees of Photoshopping on REAL printed ads, Oct. 2009. Ralph Lauren responded: ‘After further investigation, we have learned that we are responsible for the poor imaging and retouching that resulted in a very distorted image of a woman’s body. We have addressed the problem and are going forward to take every precaution to ensure that the caliber of our artwork represents our brand appropriately. '” While this example is from a clothing company, there are countless of similar examples from beauty products. Learning about these issues frustrated me because I believe that women deserve to be confident in their skin, without the pressure to conform to an idealized standard. These advertising issues were the first step to my rebellion against purchasing beauty products. Step number two stemmed from the fact that in the last decade I had never found a face wash or lotion that kept me from breaking out or made my skin feel healthy and natural. This is slightly disturbing, seeing as that is the purpose of the products and industry. So I stopped the insane battle of trying to find the perfect face wash, and I started experimenting to find a DIY recipe that was simple, cheap, and effective. It took me ONE TRY, a grand total of 15 minutes, to create the most amazing face wash I have ever used. Let me get my megaphone out really quick so I can tell the world to STOP USING THOSE RIDICULOUS CHEMICALS! Below I have included my face wash recipe for you to use, share with friends, post on your blogs, what ever you wish! I also included a cost break-down to show you how much you can save with this DIY recipe. 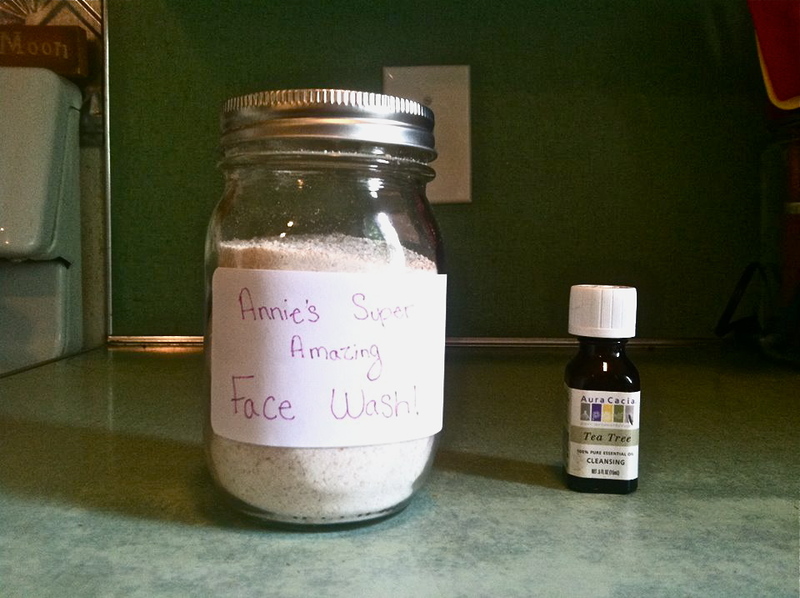 Annie’s Super Amazing Face Wash (~$5 for a three month supply, that’s about $0.05/ day). Grind oats in coffee grinder until very fine. Mix in Baking Soda until you are unable to see baking soda. Store dry in mason jar, or similar container. For more oily skin, add more Baking Soda. For dry skin add more oats. Pour a small amount of dry mixture into the palm of your hand, add a small amount of warm water to make a wet paste. Massage the mixture onto your face to clean pores and remove all the dirt from playing the day away. Always wash face at the end of the day, only in the morning if you are feeling especially greasy or if your skin needs help clearing up. For pimple spot treatment: Rub a small amount of Tea Tree Oil directly onto pimples. Rub in until dry. This works best if pimples have already risen to the skin, so the oil can penetrate the pore. Tea Tree Oil helps clear pimples by killing the bad bacteria that causes pores to become infected. “Tea tree oil is derived from the leaves of the tea tree. The tea tree was named by eighteenth century sailors, who made tea that smelled like nutmeg from the leaves of the tree growing on the swampy southeast Australian coast. Do not confuse the tea tree with the unrelated common tea plant that is used to make black and green teas. Tea tree oil is applied to the skin (used topically) for infections such as acne, fungal infections of the nail (onychomycosis), lice, scabies, athlete’s foot (tinea pedis), and ringworm. It is also used topically as a local antiseptic for cuts and abrasions, for burns, insect bites and stings, boils, vaginal infections, recurrent herpes labialis, toothache, infections of the mouth and nose, sore throat, and for ear infections such as otitis media and otitis externa. So there you go. Natural, simple, cheap, effective, and I don’t have to worry about supporting companies that do not have my best interest in mind. Thanks Mother Nature- you’ve always got my back.